I found this on Rock on TV so I'm not sure if it's really official, but VR is scheduled to appear on Letterman on August 22nd. Have a great Friday y'all!! Hopefully it's as good as the Leno performance. Scott always sounds better when he hasn't been dancing and running around and singing for half an hour already, so he usually does well on TV appearances. Which is good, because I have yet to hear a live version of The Last Fight that is better than the album version. I think exactly the contrary. yes! finally they appear on a show i'm actually able to watch, lol. awesome. i'll have to tape it! Is someone gonna post the video for those of us who can't see it? The Kimmel performance video quality is crap so does anyone have a good quality version for download for those of us who missed it? Please guys help us desperate people out. Why hasn't the BelowEmpty.com been posting any media for ages. I sent the webmaster a link to uploading.com that allows up to 100MB per upload so why hasn't the webmaster checked it out. I use that site and it is awesome. Why don't you see them live instead of watching thm live on Youtube and you'll see exactly how well they The Last Fight? I've seen them play it three times (starland, nokia, jones beach) and each time was better than the album version. You can actually hear the outtro solo from Slash when your there! Just search on youtube, I'm sure someone will post it. It's true Captain, I saw the pictures and I posted the interview on the Slash´s thread! When do the musical acts play during Letterman??? ?In the middle or end? EXCELLENT!!!!!!!! They sounded great and they looked AMAZING. Sadly, when I went back to watch the performance, my stupid Tivo just cut off the very ending... how obnoxious is that?! Wow! That was a great performance! I liked all the black too! Woo hoo!!! That was soooo cool - they looked and sounded AWESOME!!! What did Dave say to Slash at the end there? He said "Slash good to see you. Are you going hunting?" Because of the riding jacket. Ok, thanks, I'll have to check back later. Right. That's a done deal then. That was awesome! They sounded great. I'm going to sleep now. lol. Slash made me smile with that peace sign at the end there and Duff was wearing a CBGB shirt. It was good to see Scott smiling in the pics when they were entering the building. No mention of single for TLF- just " grammy winning artist with new album Libertad". Personally, I thought the performance was a bit flat compared to their others. 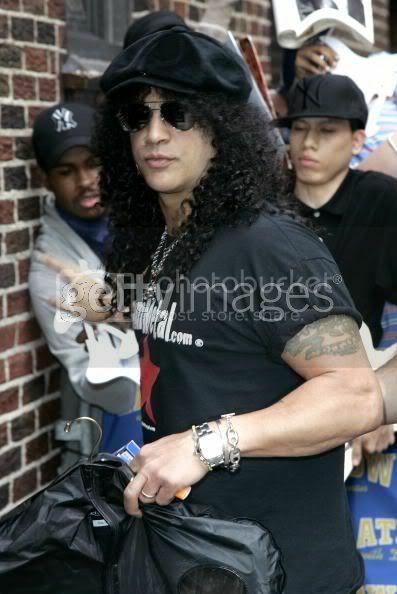 I thought Scott was straining & Slash was back to just standing there. They looked supercooll though & Scott had some great moves- maybe they just had some road fatigue. well TLF isint a song which makes you want to break walls or stomp on babies. It has a kindof chilled out feel to it. I haven't seen the performance yet... hoping for a YouTube update soon.